Discussion in 'Java Edition News' started by Camezonda, Dec 6, 2018. With last weeks Christmas update bringing a lot of Christmas joy to CubeCraft, we've decided to add more! Introducing part 2 of our Christmas update, which brings more Christmas maps to spice up your gaming experience during the holidays. Also within this update brings back our demanded Christmas game, Snowman Survival. During the Christmas period, there is a 50% OFF SALE on our Store. 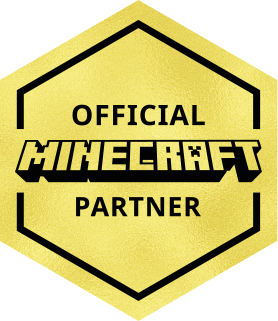 This includes Lifetime Ranks, Non-seasonal Cubelets, Multipliers and T-shirts. This means that you will be able to obtain an Iron rank for only £4.00. Hurry before the sale ends at the end of our Christmas event. Visit our store HERE. Also now available on our store are Christmas Cubelets, which contain up to 36 exclusive Christmas loot items. You can view Christmas Cubelets HERE. It's back! Snowman Survival joins the wonders of CubeCraft Games once again. Only available during Christmas, this mini-game brings a jolly and Christmas'y feeling to the infection themed games. Snowman Survival allows 8 players and there are 3 maps available to join and choose from. Snowman Survival is a fun game where the objective is to survive as long as you can, without the Snowman giving you frostbite! The game starts with 8 players, then the sacred Snowman performs a ritual and the starting Snowman is chosen. The remaining players are human survivors and have a brief grace period of 7 seconds to run away before the Snowman is released. Humans need to run and hide whilst dodging the Snowballs that the Snowmen throw! The first Snowman needs to throw his Snowballs at survivors, this will convert the Survivors in to more Snowmen. As a Snowman, you have TWO ways to shoot! Left clicking gives you a quick throw, with a predefined amount of force. Holding right click will charge your throw, it takes time but you'll be able to throw up to three times as far! You'll see this charging in your XP bar. If your throw hits a survivor, they will be converted into a snowman. HOWEVER as a Snowman you only get ONE Snowball, so use it wisely! 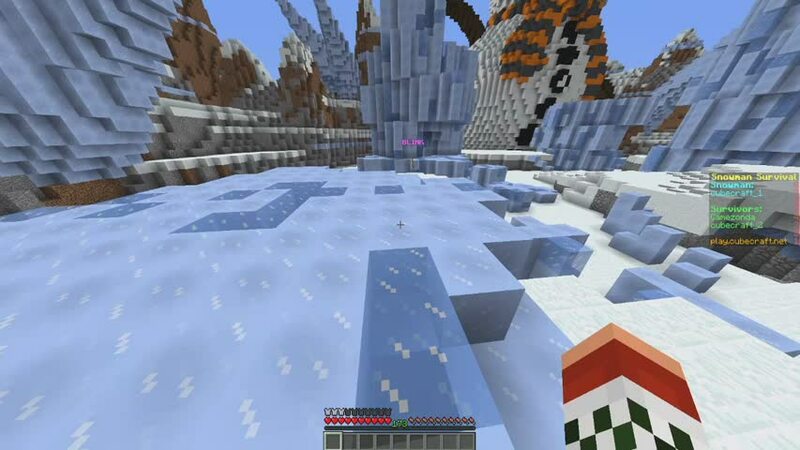 If you miss, you'll have to run and fetch the Snowball by walking over it, or wait 5 seconds and it will come back to you automatically. A Snowman launching their snowball and converting players into Snowmen. A Snowman using their player tracker. When playing as a survivor, after 30 seconds of being released, you will notice there are powerups scattered around the arena which help you run, leap and teleport away from the Snowmen. Some powerups also allow Survivors to stun and gravity explode the Snowmen, as well as trick them with decoy survivors. Speed boost – Gives you extra speed for 10 seconds. Shield – Gives you a shield that protects any snowball hit (lasts 15 seconds). Leap – Leaps you forward. Fireballs – Gives you 3 fireballs that will give Snowmen blindness and slowness for 5 seconds. Blink – Teleports where you are looking. Jump Boost – Gives you jump boost for 15 seconds. Snowman stabber – Stuns a Snowman for 10 seconds making them unable to move or shoot. Gravity explosive – Takes 1 second to charge up after use and causes an explosion that will shoot nearby Snowmen and snowballs to fly away from you. Instant wall – Builds a brick wall in front of you in 2 seconds. Decoy – Creates a clone of yourself that will last either 30 seconds or until decoy gets hit with a snowball. When decoy is alive you are completely invisible. Once again we're bringing you more amazing Christmas maps to play on. Introducing 6 more classic Christmas maps! For EggWars, SkyWars, Lucky Islands and Tower Defence. Will you be able to play them all? You can win-ter on this map. Can we please build a snowman? A map for a giant. Here's a fact-ory for you, this is a great map. We hope you guys enjoyed our Christmas updates. Don't forget to comment below we love to read your feedback! Magitroopa, asasin58, Geerty and 27 others like this. Great Christmas update. Old winter maps are back! I am so hyped about this update! Hype! Love all the christmas maps! This looks nice! Love all that christmas maps! !!!!! NICE UPDATE, NICE MAPS, NICE SALES, NICE CUBECRAFT, NICE ABOD! !!!!!! Also now available on our store are Christmas Cubelets, which contain up to 36 exclusive Christmas loot items. I already bought 10 today and I really got great loot and the miniatures are awesome!